The primary protection layer of or teeth are the gums. If the gums recede we can experience sensitivity. Gum recession is a common problem. It doesn’t cause any sensitivity at the early stage but becomes very uncomfortable as it gets worse. Gum recession can be the result of incorrect brushing technique, grinding or periodontal disease. Apart from causing sensitivity gum recession also effects the aesthetics of the smile. The root surface of the teeth become noticeable and cleaning of the cervical cavity (the gap between the receded gum and root surface) can also cause difficulties. If the recession is related to periodontal disease tooth loss is also a possible side effect in long term. The treatment of recession can help preventing further problems and can stabilize the state of the gums. Periodontal disease is the irriversible condition of the gums and can only be maintained by adequate oral hygiene and with the help of a parodontologist specialist and dental surgeon. incorrect brushing technique (scrubbing and brushing with too much force) It is important to ask for the help and advices of our dental hygienists so you can lear the right technique. If the problem is periodontal related parodontist specialist help is needed in order to prevent tooth loss and bone shrinking. The treatment involves subgingival debridement (deep cleaning/root planing) that can be carried out either by traditional equipment or modern laser treatments. 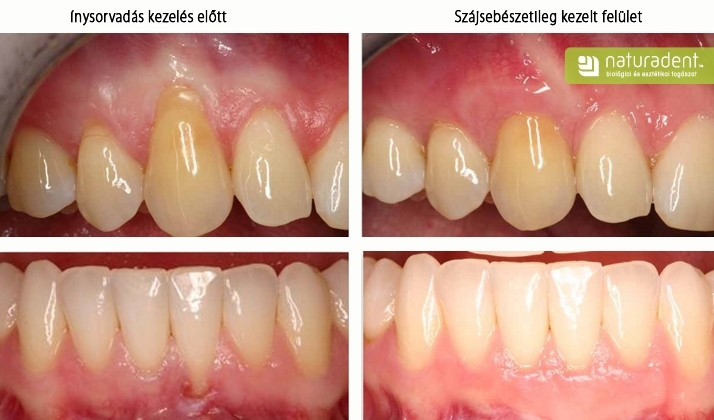 Once the gums are stabilized and not inflammed anymore we will concentrate on the aesthetics. The lost gum tissues will be replaced either by laterally moved coronally advanced flap or tunnel technique. In case of tunnel technique the creation of flap is not necessary therefore it is a more favourable procedure. After the oral surgery procedure the receded gum is positioned back and the cervical root surface is protected properly. The healing process takes a couple of weeks only and the gums will be healthy, aesthetic and functionally sufficient again. If you have noticed you have gum recession and you would like to prevent further problems such as sensitivity and discomfort please do not hesitate to ask for the help of our dental surgeons and parodontist specialists. The experienced, prepared, caring and always kind members of our team are always happy to help you with the best of their competence, care and attention.